Democratic presidential aspirants fanned out across the country Monday to praise the legacy of the Rev. Martin Luther King Jr. and offer direct appeals to black voters who will play a major role in deciding on a nominee to challenge President Donald Trump. Former Vice President Joe Biden and former New York Mayor Michael Bloomberg called for more racial justice and poverty reduction Monday. Two other potential candidates, Sens. Bernie Sanders, I-Vt., and Cory Booker, D-N.J., sat side by side in the front, middle pew at Zion Baptist Church in Columbia, South Carolina, for their Martin Luther King Day prayer service Monday morning. After the service, Sanders said King wanted "a nation that works for all of us, black and white and Latino, to make sure all people have decent wages." "Remember where he died," Sanders continued. "He died in Memphis standing with exploited sanitation workers." The outreach came on a day suffused with political commemorations. Sen. Kamala D. Harris, D-Calif., became the first black candidate to declare her campaign for the presidency, choosing the King holiday to underscore the history-making potential of her candidacy. 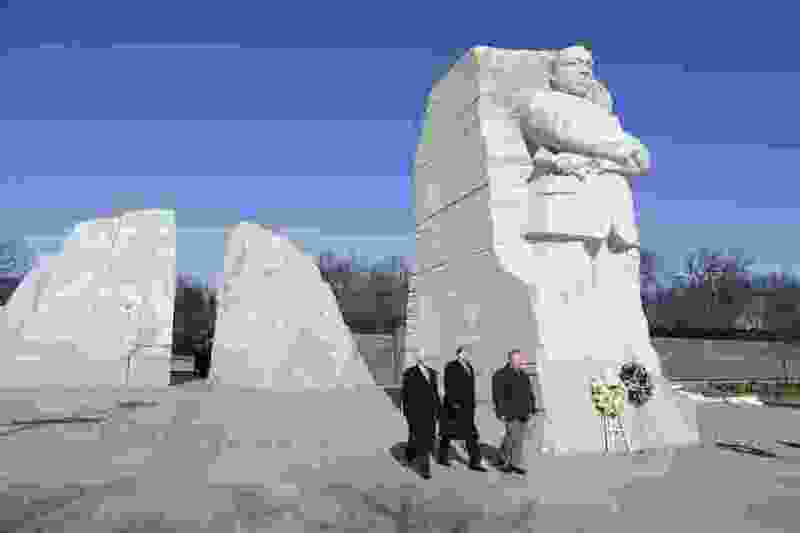 President Donald Trump and Vice President Mike Pence briefly visited the King memorial in Washington, D.C., for a wreath-laying near the carved statue of the slain civil rights leader. "Good morning, everybody. Great day. Beautiful day. Thank you for being here. Appreciate it," the president said before departing. Before the mostly black audience at the National Action Network event in Washington, both Biden and Bloomberg admitted to mistakes in their past records and laid out different policy focuses that would play a central role in their campaigns. "We have a lot to root out, most of all systematic racism that most of us whites don't even like to acknowledge even exists," Biden said. "It's been built into every aspect of our system." Bloomberg echoed the call, talking about his recent visit to Tulsa to commemorate the 1921 race riot that historians say killed more than 100 African-Americans. "We need to face up to history," Bloomberg said. "The pace of progress is still too slow, but there is not a doubt in my mind that it is possible to accelerate the pace." Neither Biden nor Bloomberg gave any hints of their decision to mount campaigns, though they both offered jokes about the possibility. Biden kidded that he had an announcement to make at the start of his remarks, and Bloomberg said he looked forward to speaking more with his friend Biden. "I wanted to get some pointers from him on what it is like to live in Washington, D.C.," Bloomberg said. The event was hosted by the Rev. Al Sharpton, who has fashioned himself as a principal emissary for potential Democratic nominees hoping to reach out to black voters. He was scheduled to attend a second event later Monday with Sen. Kirsten Gillibrand, D-N.Y., another presidential contender. Sens. Elizabeth Warren, D-Mass., Amy Klobuchar, D-Minn., and Harris spoke at Sharpton-led events last year. "Because the Trump administration has appeared so hostile, a lot of blacks are looking at who can win rather than just having a view on a set of issues that they might think are selectively important," Sharpton said about the coming campaign in an interview with The Washington Post. "It's going to be a very interesting few months." Biden was also direct in his criticism of Trump, saying that the president's decision to equate the behavior of white nationalists and counterprotesters at a 2017 rally in Charlottesville, Virginia, had allowed for ugly undercurrents of American history to re-emerge. "We learned from the last two years it doesn't take much to awaken hate, to bring folks out from under the rocks," Biden said. "We have to speak out. We have to challenge these forces of hate." Biden repeated his regret for supporting tough-on-crime measures in the 1990s, which he now admitted had worsened racial disparities. Biden successfully fought in 2010 to reduce the disparities in federal criminal sentencing for powder cocaine and crack cocaine that he had previously supported. "I haven't always been right," Biden said. "I know we haven't always gotten things right." He spoke about focusing on bail reform, increasing the minimum wage and increasing federal funding for vocational training as ways of reducing racial inequities. Bloomberg said he could not argue that "every decision I have made as mayor was perfect," though he did not specifically distance himself from the stop-and-frisk policing policy he supported over the objections of civil rights leaders like Sharpton. Instead he talked about his efforts to improve schools in New York and reduce pollution in black and Hispanic neighborhoods. He also described in detail his work with Sharpton, and his leading role in funding groups that advocate more gun regulations. "Dr. King is still our drum major for justice," Bloomberg said. "To truly celebrate the way he lived, we must redeem how he died." In a sprawling field, Bloomberg and Biden would find themselves competing for a similar slice of the Democratic electorate should they decide to run. But Bloomberg said he expected to keep their disagreements civil.